My, oh my -- can you feel it? Android excitement is certainly in the air this month. And, with each passing week, the anticipation only seems to grows thicker. Fueling the flames now is Verizon's cryptic announcement of its upcoming Droid smartphone. The phone, believed to be a Motorola device once codenamed Sholes, was revealed via a spirited TV ad and accompanying teaser site launched over the weekend. The marketing materials take clear shots at the iPhone, using the phrase "iDon't" to list all the things Apple's device can't do that the Droid can. 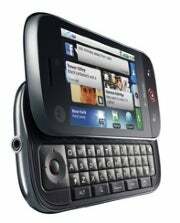 Verizon's Droid phone is one of several new Android devices on its way to the U.S. smartphone market. Here's a look at what's known about it and the other upcoming Android-based options. The only direct information about the Verizon Droid comes by way of that aforementioned iPhone-attacking ad. The commercial says the device will have a physical keyboard, interchangeable batteries, and a 5-megapixel camera with a flash. It'll also boast the ability to run simultaneous apps and widgets. Moreover, Verizon says its Droid will be fully customizable and built for open development -- two capabilities notoriously absent from that popular Apple product. • The Verizon Droid will run the Android 2.0 operating system. • It'll be about as thin as the iPhone, with the fastest Android processor seen so far (a Texas Instruments OMAP3430 chip, to be precise) and a 3.7-inch touch screen. • It'll have a custom Motorola user interface different from the MOTOBLUR skin. • The phone will also feature GPS, Wi-Fi, Bluetooth 2.0, and a 3.5-mm headphone jack. Verizon's Droid ad suggests the device will be available sometime in November. Pricing information has not been released. Motorola's first Android phone, the T-Mobile Motorola Cliq, hits the hands of existing T-Mobile customers this week and reaches new users on November 2. The device sells for $199 with a two-year contract. The Cliq runs on a Qualcomm MSM7201A 528 Mhz processor. It has a 3.1-inch touch screen, a physical keyboard, and a 5.0-megapixel camera. It also includes GPS, Wi-Fi, stereo Bluetooth, Exchange support, and a 3.5-mm headphone jack. Announced just weeks ago, Sprint's Samsung Moment smartphone is due in stores on November 1 with a $180 price tag (when purchased with a two-year contract). 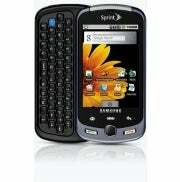 The Samsung Moment runs on an 800 Mhz processor. It has a 3.2-inch AMOLED display, a physical keyboard, an optical mouse, and a 3.2-megapixel camera with a flash, autofocus, and video camcorder. The Moment will include GPS, Wi-Fi, stereo Bluetooth, calendar sync, Exchange support, and a 3.5-mm headphone jack. Samsung's Behold II also has a 3.2-inch AMOLED screen but lacks a physical keyboard. A retooled version of its first-generation predecessor, the Behold II promises GPS, Wi-Fi and Bluetooth connectivity, and a 5.0-megapixel camera. Not much further information, including pricing or a specific release date, has been announced; the phone, however, is expected to be available by the 2009 holiday season. That's what's definitely on-tap as far as Android smartphones for the immediate future, but it's far from the end of the Android story. There's also the recently released HTC Hero, now available on Sprint, and a host of other rumored devices that may become realities soon. Those include an as-of-yet unnamed Dell Android phone for AT&T, a series of Android-based smartphones by Sony Ericsson, and one or more new Android-driven devices by LG. Verizon is also expected to release more Android options as part of its phone development pact with Google. All of that, and not a single unnaturally lowercase letter anywhere in sight. JR Raphael abuses lowercase letters at eSarcasm, his online empire of geek humor. Like Apple, he also has many things HeWon't do.